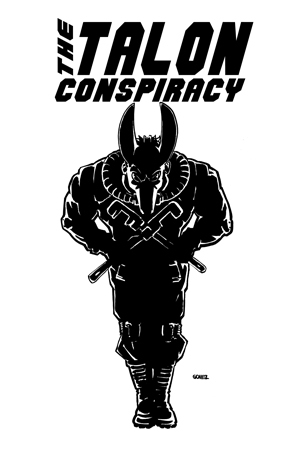 Once upon a time in the late 1990s I was down in southern California for a big activist gathering and protest. A local Food Not Bombs chapter was preparing a meal to feed the demonstrators the following day, and I ended up chopping vegetables next to this nice punk kid. At some point it came up that I was living in Eugene, and he mentioned that he might move there. We promised to keep in touch, and a little while later I saw him at a protest in front of Eugene’s federal building. “I’m sorry man, I’m terrible with names,” I apologized. “Call me Free,” he said. Free became a very recognizable face during an interesting shift in the membership of Earth First! I had grown up in Eugene during a time when the “Rednecks for Wilderness” generation were losing ground to patchoulied, pacifist hippies. No one would have guessed that just a little more than a decade later the hippies would find themselves ousted by eco-crusties, but the change of guard can’t be stopped, and Free was right there in the center of it. I had just defied a grand jury subpoena and was trying to quietly pass through Eugene. Stupidly, I stopped off for coffee at Out of the Fog, a little cafe that catered to the eco-defense and anarchist crowds. A loud voice yelled, “Man, I thought you were on the run!” It was Free, and suddenly everyone was looking at me. “Naw, man, it isn’t like that,” I muttered in the grumpy manner I am most known for. I took my coffee to go, bid Free goodbye, and then a few days later I heard the news. He had been arrested for an arson. Soon he would be sentenced to nearly 23 years in prison. 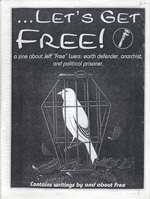 Let’s Get Free tells the story of Jeff “Free” Luers’ arrest, trial, and sentencing, along with some short articles and illustrations by Jeff himself. It was sold to benefit his legal defense fund and prison commissary fund before he eventually had his sentence reduced to about 10 years on appeal. It is a good zine, and it manages to capture some of the shock and anger felt by the activist community when one of our best comrades was buried inside the prison system as a reminder to stay in our place. What it doesn’t capture is the strength, sincerity, and warmth of Jeff Luers. I saw him recently, just a few days after my probation had ended. It had been more than 12 years since our last encounter and as he shook my hand and chatted I had to smile. The state failed to tame this young warrior. Free is free!